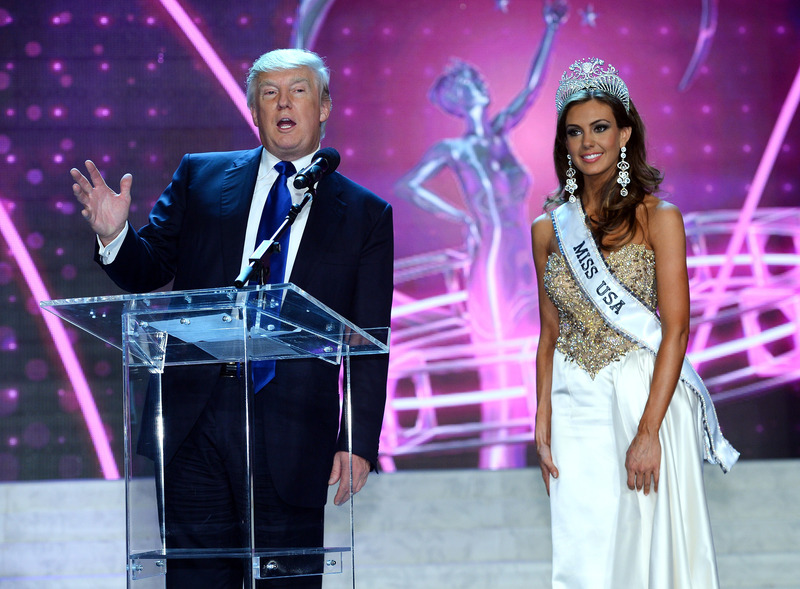 When most people think of Miss Universe or Miss USA, they think of Donald Trump — after all, his face has been synonymous with the entire Miss Universe organization (which owns Miss USA, Miss Teen USA, and more) for many, many years. But given his presidential aspirations and constant campaigning, does Donald Trump still own the Miss USA pageant? Keeping tabs on all of the ins and outs could be complicated if you’re trying to become the president of the United States of America. "At NBC, respect and dignity for all people are cornerstones of our values. Due to the recent derogatory statements by Donald Trump regarding immigrants, NBCUniversal is ending its business relationship with Mr. Trump. To that end, the annual Miss USA and Miss Universe Pageants, which are part of a joint venture between NBC and Trump, will no longer air on NBC. In addition, as Mr. Trump has already indicated, he will not be participating in The Celebrity Apprentice on NBC. Celebrity Apprentice is licensed from Mark Burnett’s United Artists Media Group and that relationship will continue." If the Miss Universe, Miss USA, and Miss Teen USA pageants have no network to air them on television, they are essentially worthless — if a pageant is produced in the forest and no one can see it, does it even exist? Trump had some key words about NBCUniversal’s decision and said the following, according to Entertainment Weekly. "If NBC is so weak and so foolish to not understand the serious illegal immigration problem in the United States, coupled with the horrendous and unfair trade deals we are making with Mexico, then their contract violating closure of Miss Universe/Miss USA will be determined in court." However, there was no court date. Just two months later, Trump sold Miss USA to WME/IMG, who had previously helped produce the pageants and now own it outright. And with this change comes another change in network, as the 2016 Miss USA pageant will air on FOX this Sunday night, just like the 2015 Miss Universe pageant did. Now that we've gotten through the logistics of what's been happening behind the scenes of Miss USA, here’s what I’m most excited to see happen on stage at the 2016 Miss USA pageant. People so rarely dress up for anything these days, so I appreciate the fact that the hair at these pageants is sky-high and the mascaraed lashes a mile long. It can make you feel fancy, even if you're watching in your pajamas. I know it's a pageant, but the Miss USA competition usually has some decent musical acts. Nick Jonas performed a few years back, and this year's broadcast has the Backstreet Boys (be still, my 12-year-old heart) and country star Chris Young getting on stage between competitions. There are many stereotypes out there about beauty pageant contestants, but the Q&A portion of Miss USA allows the finalists to show off their intelligence. I think nerves sometimes get the best of people, but the contestants usually answer their questions in a thoughtful, smart way, and this is one part of pageants that I hope viewers really pay attention to. Though the Miss USA pageant changed ownership since last year, Sunday night's broadcast will still have these elements that keep viewers tuning in every year.